There is much development going on in the prooph team at the moment. The new event-store-client is more stable every day and development of event-store v8 is beginning soon (a lot of planning and experimenting is done already). So naturally it was time to check if other components could need some new major version as well. There was a bit of a discussion on changes to prooph/common (#70, #71, #72) and a new prototype for snapshotter and event-sourcing component was created as well. This was the point, where I stopped and started rethinking it completely. After I could put my thoughts together I spoke with Alexander Miertsch (the other prooph maintainer). As usual, even though we are two different people, we share the same mind and could agree pretty fast on how to proceed further. Prooph hereby announces that the development of prooph/service-bus and prooph/event-sourcing will be dropped. This also includes all snapshot-store implementations as well as message producers. All components will receive support until December 31, 2019 and will then be marked as deprecated and receive no further support from the prooph core team. In fact, we recommend not using any framework or library as part of your domain model, and building the few lines of code needed to implement a left fold yourself - partly to ensure understanding and partly to keep your domain model dependency-free. The event-sourcing component was always meant to be a blueprint for a homegrown implementation but most people installed and used it as is, thus the prooph core team was complicit in advertising bad practices. Don't worry, we will also ship some blueprints as inspiration on how to implement an aggregate root and aggregate repository, but this time, it's part of the documentation and not a repository that you could install again. You can still copy / paste from it and make it run, it's your choice. When it was originally developed, there was no good alternative out there. In the meantime symfony shipped its own messenger component (I looked into it, it looks really great!) and sooner or later, it will probably have more downloads then our famous service-bus implementation. This also means we now have a clear focus on developing prooph/event-store and provide even better documentation for it. The next goals are first to stabilize the new event-store-client and write documentation and more tests for it, and then start with the development of prooph/event-store v8. When even Greg Young, the author of the original EventStore implementation (http://geteventstore.com/) says that it's a bad idea to implement a Kafka EventStore, than it's a bad idea. The prooph-team will not provide a Kafka EventStore implementation. When an event with same version is appended twice to the event-store, only the first attempt is allowed to succeed. This is very important, imagine you have multiple processes inserting event to an existing stream, let's say we have an an existing aggregate with only one event (version 1). Now two processes insert two events, so we have: event 1, event 2, event 2', event 3, event 3'. Next another process is inserting an event 4. If the consumer of the stream has to decide whether or not an event belongs to the stream, it's a hard decision now, because we could have the following possible event streams: event 1, event 2, event 3, event 4 or event 1, event 2', event 3, event 4 or event 1, event 2, event 3', event 4 or event 1, event 2', event 3', event 4. Additionally you can't rely on timing (let's say event 2 was inserted slightly before event 2'), because on a different data center the order could be the other way around. The matter complicates the further the event stream goes. And this is not a blockchain-like problem, where simply the longest chain wins, because sometimes, there will be no more additional events to an existing stream. I have to add, that this concurrency check requirement and version constraint might not be needed for all use-cases, in some applications it might be okay to just record whatever happened and versions / order don't matter at all (or not that much), but for a general purpose event-store implementation (where you don't wanna put dozens of warnings, and stuff), this will only bring problems and lot of bug-reports. This option is also available for prooph-event-store, limiting the usage to disallow this strategy is possibile, but not really wanted. To quote Greg Young: "You need stream per aggregate not type. You can do single aggregate instance for all instances but it's yucky"
While at first glance obvious, the event store should persist the event forever, it's not allowed to be removed, garbage collected or deleted on server shutdown. Another quite obvious thing to consider at first: Given you loaded an aggregate from a snapshot, you already have it at a specific version (let's say event version is 10 f.e.). Then you only need to load events starting from 11. This is especially important, once you have thousands of events in an aggregate (imagine you would need to load all 5000 events again, instead of only the last 3, event when you have a snapshot). Even more important when one stream per aggregate is not possible. >> cluster and gets rid of things like the need for optimistic concurrency. This this one is a really big issue. If I have thousands of aggregates and each have a topic, Kafka (and ZooKeeper specifically) will explode. These are real problems with Kafka. ZooKeeper can't handle 10M partitions right now. On Kafka events expire! Yes really, they expire! Fortunately enough, with never versions of Kafka, you can configure it to not expire messages at all (day saved!). Here we go, that's not possibile with Kafka! Combine that with the "One stream per aggregate" problem, and here we go full nightmare. It's simply not reasonable to read millions or even billions of events, just to replay the 5 events you're interessted in to your aggregate root. "Queryingevent offset" issue, because you can use stuff like "idempotent producer semantics" (to track producer id and position in event stream) and in-memory checks of aggregates, to go around the concurrency checks requirement. But prooph are PHP components and even if we would implement some akka-like infrastructure, that would be a rare use-case that someone wanted to use this implementation. >> don't care about any more). >> This can turn into a very expensive operation/decision. >> Not everyone who sends a message is "event sourcing"
Kafka is great for stream processing. With enqueue (github.com/php-enqueue/enqueue-dev) and prooph's enqueue-producer (github.com/prooph/psb-enqueue-producer/) you can already send messages to Kafka for processing. So send your messages to Kafka, if you need or want to. In my opinion a Kafka EventStore implementation would be very limited and not useful for most of the PHP applications build. Therefor I think there will never be a Kafka EventStore implementation (not in prooph, nor in any other programming language - correct me if I'm wrong and you know an open source Kafka EventStore implementation somewhere!). When even Greg Young things a Kafka EventStore is a bad idea, I'm at least not the only one out there. I recommend this thread for everyone you wants to dig deaper into the problems with Kafka as an EventStore. Authorization with prooph components and event sourced aggregates roots are a common problem to solve. Here is a short explanation on how to do this using Zend\Authentication. First of all, we need an aggregate root class for it. Here is a minimal example with some basic properties. This is a very simple example, omitting the event classes and value objects. It might be worth adding some additional methods and/ or properties, when needed. The login command simply takes the email address and password as parameters, that's simple enough for us now, so what's needed is a command handler for Login / Logout. That should be enough for now. We also need an implementation of Zend\Authentication\Storage\StorageInterface. In this case, we use MongoDB as backend. * has been collected during the authenticate() attempt. * identity provided to this adapter. 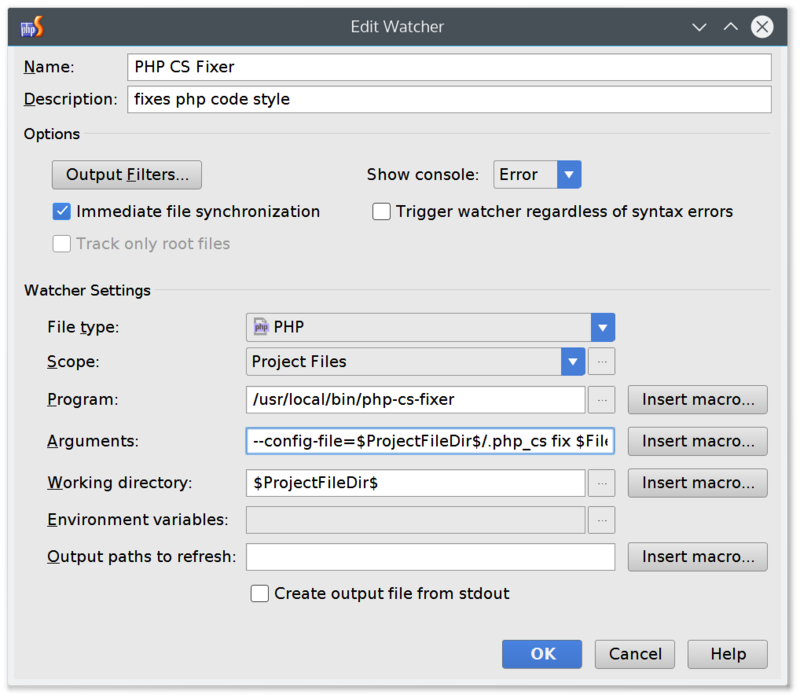 Second have a project-specific php-cs config file. As an example take a look here. 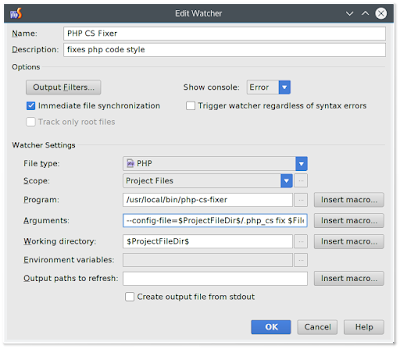 In PHPStorm click "File" -> "Settings" -> "Tools" -> "File Watchers"
Hint: You can also ommit the --dry-run option, to let PHP-CS-Fixer automatically fix your code. When you record events with the Prooph EventStore only the payload (the event data that was recorded by your aggregate roots) gets recorded. If you use the EventStore together with the Prooph ServiceBus and enable the TransactionManager from the EventStoreBusBridge, some additional metadata gets recorded, too. That is the "causation_id" and the "causation_name" (the command id that triggered this event and the command name). In a real-word application you might want to record some additional metadata, like "who" issued the command, what was his IP address, which user-agent did he use, and so on. This is especially useful when you want to know, which commands "John Doe" sent to the system. The simplest way to achieve this, is to use an EventStore-Plugin. Here is an example for Zend Framework 2, using the Zend\Authentication component to get the issuer and Zend\Http\PhpEnvironment\RemoteAddress to get the client's IP address. * adds the issued_by (user id), ip_address and user_agent as metadata to each event. Now you only need to extend your commands from this base-class. Note: If you work with Prooph EventStore, you don't need to extends the base-classes from Prooph, like Command. You're free to implement them by yourself for your needs.